Coulter, Rebecca Priegert. "War Brides". The Canadian Encyclopedia, 10 September 2018, Historica Canada. https://www.thecanadianencyclopedia.ca/en/article/war-brides. Accessed 23 April 2019. 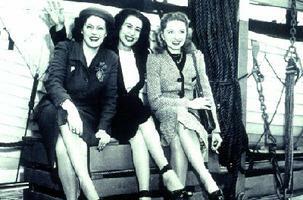 Nearly 48 000 wives and 22 000 children immigrated to Canada as dependents of Canadian servicemen during and after WWII. These women are Canadian wives heading in the opposite direction, to Norway (courtesy Associated Press Photograph, Toronto Telegram Collection, York University Archives). This term gained popular currency during WWII to describe women who married Canadian servicemen overseas and then immigrated to Canada after the war to join their husbands. It is now also used to describe women who had similar experiences after WWI. By the end of 1946, there had been 47 783 marriages between Canadian men and European women, which produced 21 950 children. The vast majority (44 886) were from Great Britain, with much smaller numbers coming from Holland, Belgium, France and elsewhere. Some 80% married soldiers, whereas 18% married men in the RCAF and the remainder married men in the navy. Although all of the servicemen's wives were eligible to come to Canada, an estimated 4500 war brides declined to make the trip. By 31 March 1948, the Canadian government had transported 43 454 wives and 20 997 children to Canada. The Canadian government provided the war brides with free sea and rail passage from their original homes to their destinations in Canada, as well as daily food allowances and free access to medical care on boats and trains. Many of the war brides were unprepared for the conditions they found in Canada, but most stayed and adjusted to a new way of life.